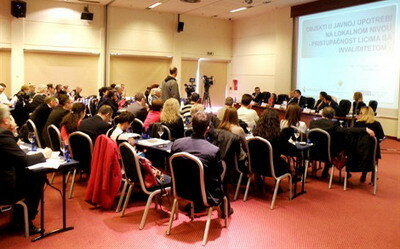 The conference “Facilities in public use at the local level – Accessibility for persons with disabilities” was organized by the Ministry of Sustainable Development and Tourism and the Union of Municipalities of Montenegro, with the support of the OSCE Mission to Montenegro, from 16-17 December 2015.The conference aim is raising awareness of the accessibility of facilities for persons with disabilities, as well as analysis of the results of the removal of architectural barriers at the local level. The event brought together participants who are dealing with the accessibility of buildings for persons with disabilities – the Ministers of relevant ministries, mayors, presidents of municipalities, the main administrators, heads of local administrations in charge of urban planning and construction of facilities, managers of public companies and public institutions founded by the municipality, representatives of non-governmental organizations dealing with the protection of the rights of persons with disabilities, activists at the local level, as well as the civil sector in general. The conference presents the activities of the central authorities and local governments in the provision of access and movement of disabled persons to the facilities for public use. The conference was opened by Mr.Branimir Gvozdenovic, Minister of Sustainable Development and Tourism, H.E. Ambassador Janina Hrebickova, Head of the OSCE Mission to Montenegro, Mr. Aleksandar Bogdanovic, Mayor of the Old Royal Capital Cetinje and President of the Union of Municipalities Executive Board, Mr.Suad Numanovic, Minister for Human and Minority Rights, Mr.Nikola Dedeic , Secretary of the Ministry of Labour and Social Welfare and Ms.Natasa Borovic – representative of NGO Association of Paraplegics of Montenegro. The conference presents the activities of the central authorities and local governments in the provision of access and movement of disabled persons to facilities in public use. It has been concluded that in the future it is needed especially to meet challenges such as: informing the professional public on this issue, intensifying the training of professional staff, and further improvement of the administrative capacities and the issue of financial resources required for implementation of the plans in this area.